Realistic simulations and engineering innovations help to improve therapy of blood vessel diseases by involving detailed information about a blood vessel wall architecture. This information is especially needed in a constitutive modeling of tissues. 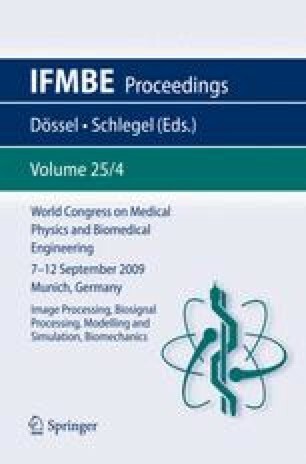 This study presents a computational method for evaluating of arterial internal structure based on analysis of histological sections. Presented algorithm searches dominant directions in binary pixel maps of histological sections filtered according to a constituent, which was previously stained. Particular constituent is represented by pixels with the value one in a black and white image. Neighborhood of each non-zero pixel is analyzed by a rotating line segment. Dependence between the number of non-zero image pixels shared by the line segment and the segment angle is found. The rotation with maximum number of non-zero pixels determines local dominant direction for the pixel in the given neighborhood. By applying this procedure to all non-zero pixels of the binary image an empirical distribution function of preferred directions in the whole image is provided. This method was tested in four histological sections of human abdominal aorta. A distribution of collagen fibrils’ directions was evaluated for medial and adventitial layer. Two sections for every layer were analyzed. one with a long axis aligned to the axial direction of the aorta and one aligned circumferentially. Graphs of empirical probability density functions are presented. Results proved that collagen fibrils are not aligned in finite number of directions. However, the distribution in adventitial layer had two significant peaks almost symmetrically disposed to circumferential and axial direction of the artery wall. Peaks correspond to ≈67° and ≈112° (angle is measured from axial to circumferential direction). Sections of the medial layer did not provide unambiguous results.